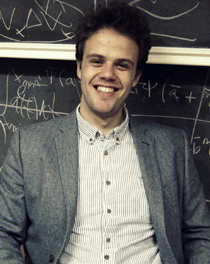 Johan Samsing, who is just about to complete his PhD at Dark Cosmology Centre at the Niels Bohr Institute, has just been awarded one of the most prestigious research fellowships in astrophysics, the so-called ‘Einstein Fellowship’. It is awarded each year by NASA and the winners are chosen through an international competition. “I have worked hard over the last few years, but I still never thought that I could compete with the best students from around the world and then win at that. I now have an incredible opportunity to study more of the mysteries of the universe and I am just looking forward to starting. It will be incredibly exciting,” says Johan Samsing. An Einstein Fellowship is a research grant that can be brought to a number of universities in the United States and it is very sought after internationally as it provides incredible opportunities for independent research and international cooperation. Johan Samsing has chosen to take his Einstein Fellowship to Princeton University, where he will research everything from gravitational waves and the expansion of our universe to the interaction between stars and compact objects. Associate Professor Steen Hansen, Johan Samsing’s supervisor at the Dark Cosmology Centre, believes that there have been very few Danes who have received a similar grant of the same prestige. So it is very big. Johan Samsing’s work spans several subjects - from the exploration of dark energy using microwave background radiation and the movement of dark matter to stellar dynamics and gravitational waves from black holes and neutron stars. His recent research has primarily been done in collaboration with researchers from the University of Berkeley and the University of Santa Cruz, where he has spent much of his time. Right now he is working with wave effects in the mutual interaction of stars and the dynamics of dark matter during collisions between galaxies. In addition to having received the prestigious Einstein Fellowship, Princeton University has chosen to award Johan Samsing another research grant, the so-called ‘Spitzer Fellowship’. Johan has now secured the best opportunities for interesting future research.